The legend of Santa Claus and his reindeer bringing toys to the children of the world has become a symbol of Christmas for many Americans. In England, children look forward to a visit from Father Christmas, a fellow who pops down the chimney to leave presents and sample the mincemeat pies and milk or brandy left for him. The French leave out shoes filled with carrots and treats for Pere Noel's donkey, and to receive his gifts of candy, money, or small toys. Parallel Christmas traditions take place throughout Europe, all of them based on the life of one man. Nicholas was a bishop who lived in the fourth-century village of Patara in what was then part of Greek but is now modern-day turkey. His parents died while still young in an epidemic, leaving him their wealth. Following the example set by his Lord, Jesus Christ, Nicholas gave his inheritance to help the poor, the sick, and to alleviate suffering. Often he gave his gifts in secret. Many stories remain of his kindness, which was legendary. One of the most famous tales of Nicholas is that on three occasions he secretly dropped bags of gold through an open window to help provide dowries for the three daughters of a poor man. They are said to have fallen into stockings or shoes drying by the fireside, thus starting the Christmas tradition of leaving stockings or shoes by the fireplace. The father of the daughters caught Nicholas throwing the last bag of gold through the window and afterwards told everyone what he had done. Whenever anyone received a secret gift, it would be thought to have come from Nicholas. Diocletian, a Roman Emperor who persecuted Christians, exiled and imprisoned Bishop Nicholas because of his faith. He was later released and died in AD 343 and was buried in Myra. 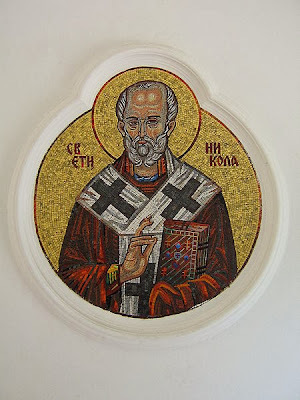 December 6th, the anniversary of his death, is celebrated with great anticipation as Saint Nicholas Day. In many countries, this is when children leave out stockings or shoes to be filled with treats and gifts. In the 1950's the bones of Saint Nicholas were removed while his crypt was repaired. The Vatican requested that the skull and bones be studied. Because of advances in forensic anthropology, a computerized likeness of Saint Nicholas's face has been generated. It's interesting to compare the computerized image with historical renditions of Saint Nicholas. This Christmas as we celebrate the birth of Jesus, the Christ, we can also rejoice in the life of one of his devoted servants. What would it be like to live a life so loving you leave a legacy of kindness? 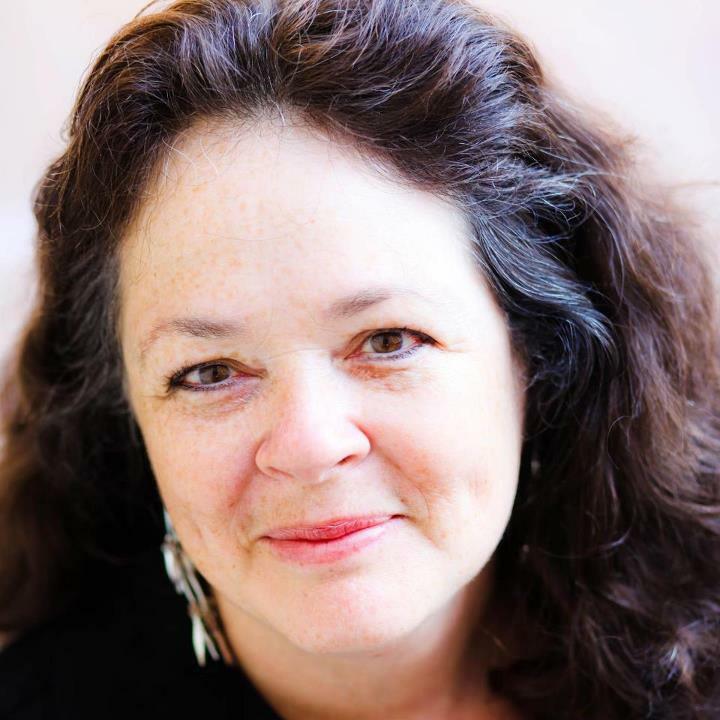 This post is brought to you by Janalyn Voigt. Escape into Creative Worlds of fiction. Janalyn Voigt's unique blend of adventure, romance, suspense, and fantasy creates worlds of beauty and danger for readers. 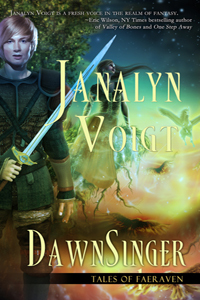 Beginning with DawnSinger, her epic fantasy series, Tales of Faeraven, carries the reader into a land only imagined in dreams. A headstrong young princess and the guardian sworn to protect her fly on winged horses to the Gate of Life above the Well of Light in a desperate bid to release the DawnKing, and the salvation he offers, into a divided land. Will they each learn in time that sometimes victory comes only through surrender? Click to purchase DawnSinger for Christmas giving. You do not know how much trouble I got from my girls when I shared this story of the real St. Nicholas! They still tease me about it even now that they're grown! LOL! No, but I'll have to do that next year! Thanks! Janalyn, I really found this very interesting. Thanks for this information. GOD bless you and have a Merry Christmas.